Club Penguin Cheats by Mimo777 Club Penguin Cheats by Mimo777: Gary on Club Penguin! Just as Club Penguin promised in this video, Gary did come to meet us on the server Rainbow! So I waited and looked around for him for a while. And I finally found him and got to meet him at the Beach! I got his background and got him to add him as a buddy! Have you met him yet? If not, keep looking you'll find him! 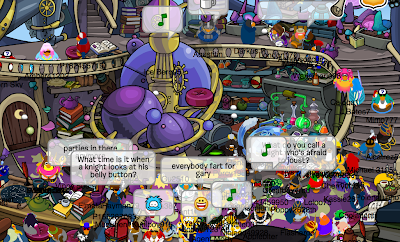 I could see my penguin in the first picture well sort of im the nonmember water ninja dancing with the water in the air by the potion table and I saw Gary twice once at the Pizza Parlour and once at the Lighthouse.When he came into the Lighthouse he was on top of the chair of the thing with planets in the middle of the room and no one else can reach the chair Gary is on. He added everyone and gave the backgrounds out, good thing cp didnt lie. Mimo, did you see me? When I went on (aussie time), G went all the way to the top of the ski mountain before journeying back down to the town. He was so cool! 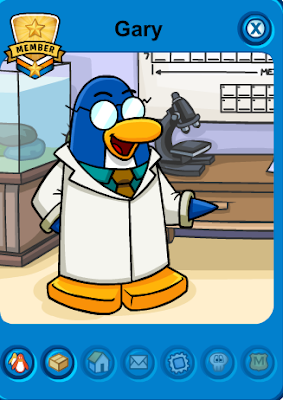 While he was on the mountain top, penguins asked him questions like," Is herbert working with Scorn?" and "Is Herbert coming back soon?" All G said was,"Who is this herbert you talk about?" P.S. Please give me credit. PLEASE! And for some reason you never publish my comments, please publish this one! Mimo, look through the telescope at the beacon! There's a small, glowing, red orb. It may be a signal from Rockhopper! I met him there too! I was so happy! I friended Gary, got the stamp, background and met him! I wanna thank you for posting that video! If you didn't, I never would have met him! I owe you one I guess, thanks, I am really happy today! I wish they had told us where to look for him. There's over 42 rooms. All five of us waited and waited for over an hour. Ran back and forth in all the Scorn Quest rooms and none of us ever did get to see him. 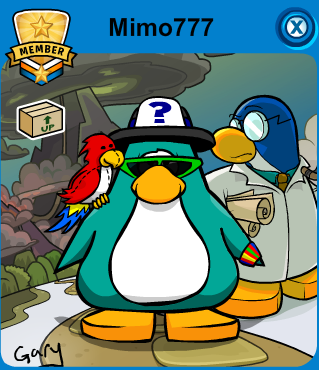 mimo,guess what i found out!if you have already made Gary your friend during the last party he was at,then just click his player card whenever he is online and you can click the gift button and it will give it to you!and of course if it works with Gary,then it will work for every other famous penguin or whatever we call them. Omg I'm sorry but I wish everyone would stop saying this -.- Everyone made this at the Adventure Party. anonymous, that red glowing dot is and asteroid. not to be mean but im just letting you know. Anonymous that flashing light is an asteroid. How to get that armor? I've met him but forgot to add him.